Invalid Bundle - One or more dynamic libraries that are referenced by your app are not present in the dylib search path. there is no specific information here. How can I debug it? The list of paths you get should match what you find inside of your IPA. All of your libraries should start with @rpath. A simple comparison of everything in this list with the unzipped IPA folders should reveal what is missing. Once you know what is missing, go to your Xcode build phases setup. There should be a build phase for either Copy Files or Embed Frameworks that includes the missing library — you should just add the library to the list. If you don’t see either of these build phases, you can recreate it by adding a new Copy Files build phase, setting the Destination to Frameworks, and adding the library to the list, ensuring that Code Sign On Copy is checked. If you don’t find anything missing in your main binary, make sure to do the same search on any other binaries you may have, like for a watchOS app or an iOS app extension. If you find that all of the frameworks are in this build phase, please take a look at the Embedded Binaries section of your app target’s General page, and let me know if you see multiple levels of ../ next to the binary that you found is missing. Please let me know if it works for you! I have encountered the same issue when uploading an app with watch support to the app store. I was able to solve it with the hint from the first answer, using otool -L to analyze the binary from the ipa or xcarchive. However, the problem was not with my frameworks (at @rpath) but with a swift lib. I noticed that libswiftWatchKit.dylib was missing in the frameworks folder. The solution that worked for me was as simple as to set EMBEDDED_CONTENT_CONTAINS_SWIFT=YES in the build settings of the watch app (or the watch app extension, but not both). After that, all necessary swift libraries were correctly copied to the watch app path in the archive and upload to app store was working correctly. Apparently, the watch app works and upload passes if you provide the necessary swift libraries only in the main app's folder. After adding the custom Swift framework to my project I got this email after uploading the app to iTunes connect. Step 1: Make sure your Custom framework is added to Embedded Binaries in General tab of your target. Set Always Embed Swift Standard Libraries = Yes for your main project target. And Set Always Embed Swift Standard Libraries = No for your custom framework target. This solved my problem and I was able to upload binary to iTunes connect. My Problem: I had the same error with embedded frameworks. The app built to the simulator and to devices with no problem but failed the Apple test, returning "Invalid Bundle". I inspected the package just like Taha had been told to by Tech Support and everything was present and correct! My Solution: I restructured the project so that the two custom frameworks sit side by side and one is no longer embedded within the other. This looks to be an Apple validation problem since everything works fine on devices and the simulator but the work around was straight forward. I had the same problem, it was due to one framework not being present in the Frameworks subfolder in the app bundle. I fixed it by adding a Copy Fields build phase, and adding the missing .framework file there. You can find the error message under the heading "Missing Framework Bundle" with troubleshooting steps. Tried all the above solutions and did not work for me. I was experiencing this issue in Xcode 10.1 recently and all my frameworks were referenced correctly (did otool -L and everything lined up). Seems there were some changes in the apple validation process, may be a bug, may not be on Apple's end, but all my prior builds uploaded and validated fine -- and I did not add any new frameworks since. Invalid Bundle - The app uses Swift, but one of the binaries could not link to it because it wasn't found. Check that the app bundles correctly embed Swift standard libraries using the "Always Embed Swift Standard Libraries" build setting, and that each binary which uses Swift has correct search paths to the embedded Swift standard libraries using the "Runpath Search Paths" build setting. 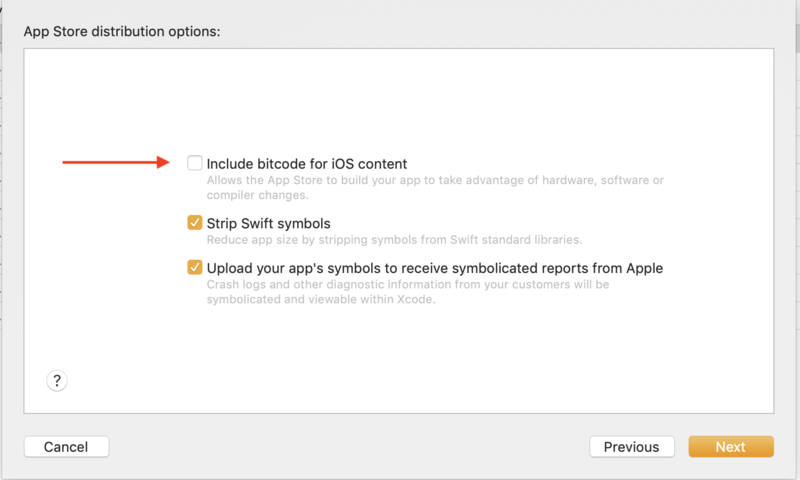 After days of debugging, what worked for me was to disable 'Include bitcode for iOS content' upon uploading the archive from Xcode organizer. Seems that this option modifies the binary which caused the validator to fail. So I struggled on this for two days. What it turned out to be was I had UITests checked in Archive for the Build for the Scheme I was archiving. After unchecking it from Archive, re-archiving it, validating it (although validating it before always passed), and "Upload to AppStore" I did not get the e-mail from Apple informing me of Invalid Swift Support. Instead I got the e-mail that it'd been processed and is good to go! Had same issue. This happened to me because one of my Framework target was added to main target in "Link Binary With Libraries" but was not added to "Target Dependencies" and "Embedded Binaries"
We had the same problem, and even after going through all the steps (see "Missing Framework Bundle"), the only thing that worked was disabling Bitcode. Not the answer you're looking for? Browse other questions tagged ios testflight appstore-approval or ask your own question.